GFAS is thrilled to add two new members to our Board of Directors. Please help us in welcoming, Jill Nicoll, past Executive Vice President of the Association of Zoos & Aquariums (AZA) and Melissa Rubin, Senior Vice President of Animal Response, Care, and Sanctuary at the Humane Society of the United States. Learn more about Jill and Melissa, as well as all of our other board members here. 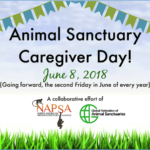 On June 8th we shared in the celebration of Sanctuary Caregiver Day. GFAS, along with the North American Primate Sanctuary Alliance (NAPSA), established the day in 2017 to recognize the important work of animal caregivers – often the “unsung heroes” – in animal sanctuaries, rescue centers, and wildlife rehabilitation centers worldwide. Read more here. 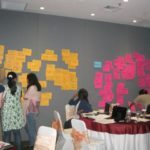 GFAS, with the generous support of Arcus Foundation, hosted an intensive 2-day strategic planning workshop in June in Indonesia for a select group of sanctuaries and rehabilitation centers. Jackie Bennett, Program Director for Africa and Asia, worked with Lauren Glickman of Foray Consulting to design a series of pre-workshop webinars and training materials to guide participants through steps of examining mission and vision statements, conducting a SWOT analysis, engaging stakeholders, and writing goals. With Lauren’s expert facilitation, a lively group discussion identified common strengths, opportunities and challenges among groups in the region, and explored ways in which they could collaborate to meet common goals. We are looking forward to following up with these sanctuaries as they continue their work on becoming stronger and more sustainable. As GFAS works with sanctuaries and rescue centers across the world, we are in a unique position to bring organizations together across the continents to provide peer support and share ideas on best practices in areas from animal care to volunteer programs to social media strategy, and more. GFAS is excited to be building a mentoring and networking program, to connect our sanctuaries, as well as other facilities that may be just getting started, or looking to improve an area of practice. We are looking to have website enhancements including a discussion board and a site for photos, video clips, and sample documents. Stay tuned for more information! For the third year, GFAS has partnered with Arcus Foundation to present Giving Day for Apes, a global day to raise awareness and individual support for sanctuaries and rescue centers providing care to great apes and gibbons throughout Africa, Asia, and North America. The day was established to provide capacity building for these organizations in using social media as a fund development tool. Participants are offered webinars and other resources to design their fundraising pages, devise strategies for donor outreach, and hone their messaging to make the most impact. The 2018 event was the biggest ever: 37 organizations participated, including GFAS accredited and verified sanctuaries on all three continents. Each participant raised donations leading up to the 24-hour online Giving Day on September 25, which was incentivized with $50,000 in prize funds as well. A record-breaking total of $558,579 was raised and awarded this year. In addition to the support of Arcus Foundation, the generosity of prize sponsors American Anti-Vivisection Society and Maria Norbury Foundation made this day a success. You can visit the event website to learn more and see this year’s results at www.givingdayforapes.org. In August, Saddlebred Rescue invited GFAS Program Director-Equine, Valerie Taylor, to speak at their annual fundraiser. The New Jersey-based, GFAS Verified equine group holds the event each year in Louisville, Kentucky in conjunction with the Kentucky State Fair American Saddlebred World’s Championship Horse Show. Valerie spoke to attendees including exhibitors, owners, and breed association representatives to bolster support for Saddlebred Rescue and to detail how GFAS Verification ensures humane and responsible care for the rescue’s horses as well as organizational credibility and sustainability. 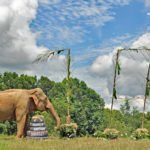 On July 6, 2018, GFAS joined The Elephant Sanctuary, in celebrating Asian elephant Shirley’s, 70th birthday! The Elephant Sanctuary in Tennessee provides lifetime care to elephants retired from performance and exhibition, many of whom suffer long-term health and behavioral issues common to aging captive elephants. As these elephants age, they require greater care and veterinary attention. To better provide for their aging elephants, The Elephant Sanctuary is preparing to break ground on a new, state of the art, Elephant Health Care Center! Shirley, one of the oldest living elephants in North America, is the inspiration. GFAS congratulates The Elephant Sanctuary on the development of their new care center and for their continued commitment to providing a safe haven and quality care for captive elephants. GFAS Program Director-Equine, Valerie Taylor, recently visited GFAS Verified Speak Up for Horses, Kentucky. This equine group received their original GFAS Verification in 2011 and has continued to work hard to fulfill their mission of educating the public on the plight of equines-in-need. In addition to providing exemplary daily care for rescued horses, Speak Up for Horses stays abreast of current issues affecting equines, such as efforts to end horse slaughter in the U.S. 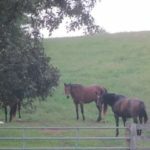 Many educational resources are available on the group’s website, and becoming a follower of their Facebook page is great way to keep up-to-date on equine issues. Visit the Speak Up for Horse Facebook page here. Allan Kornberg, MD, serving as GFAS’ executive director this year, having been board chair and on the GFAS board since 2012, recently visited two farm animal sanctuaries in close proximity – Catskill Animal Sanctuary and Woodstock Farm Sanctuary, in the Hudson Valley, NY. These two well established farm animal sanctuaries provide outstanding care to the farm animals in their stewardship. And are within thirty minutes of each other, working closely together, particularly on activities beyond the sanctuary in furtherance of farm animal protection and promoting plant based diets. Allan participated in a joint staff meeting luncheon with the two sanctuaries hosted at Catskill where broad issues of farm animal protection were discussed over vegan pizza. Catskill has been an accredited GFAS sanctuary since 2015. At Woodstock, Allan joined Valerie Taylor, GFAS’ equine and farm animal director, for a site visit as the culminating step in it’s application for accreditation. Allan had been executive director of Farm Sanctuary, another GFAS accredited sanctuary, and the first farm animal sanctuary in North America, with locations in New York and California. GFAS’ farm animal program is blossoming with 5 certified sanctuaries and 18 in process.